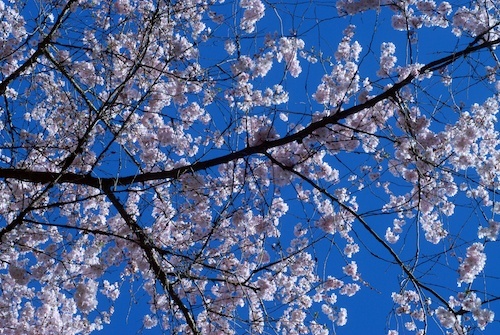 How better to celebrate spring than a picnic with the family under the cherry trees? Along with my husband and son, a few weeks ago I enjoyed a sunny afternoon and delicate cherry blossoms in the Washington Park Arboretum. Lots of other families were doing the same and taking photos of their loved ones smiling against a backdrop of pink or white cherry petals. We brought the traditional snack for cherry blossom viewing: onigiri. It’s a very easy to-go recipe, the Asian equivalent of a sandwich. You cook sushi rice, put a bit of filling in the middle of a ball of rice, wrap the rice in sturdy plastic wrap and form it into a triangle. If you don’t want try to make a triangle, a round ball will do, they sometimes eat it that way in Japan, too. 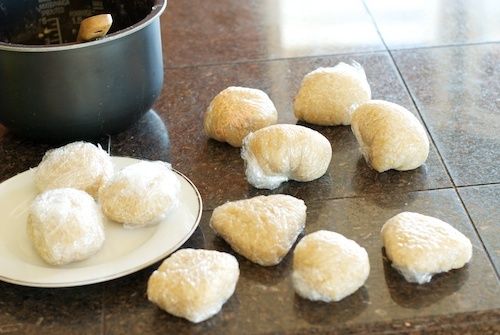 The rice ball can be stored and transported in the plastic wrap until snack time. 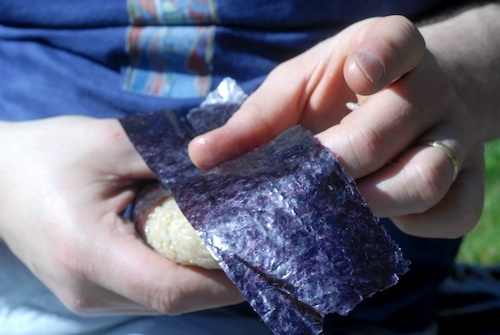 Then you remove the plastic and wrap the onigiri in a strip of nori to give it a non-sticky handle. Waiting until snack time keeps the nori crisp, otherwise it would get soggy. We still got a little sticky during the wrapping process, so I’m glad we packed a washcloth, too. The filling can be made vegetarian or with fish or meat, or you could have just plain rice balls with no filling. We used a little wild salmon mixed with mayonnaise. A bit of salty umeboshi plum is a traditional choice. You could really use anything you want, including lots of vegetarian choices like grilled onion or mushroom or baked tofu. I don’t think I could do better than Jenny of Asian Lifestyle Design in explaining how to make an onigiri so here’s a link to her onigiri post and how-to video. 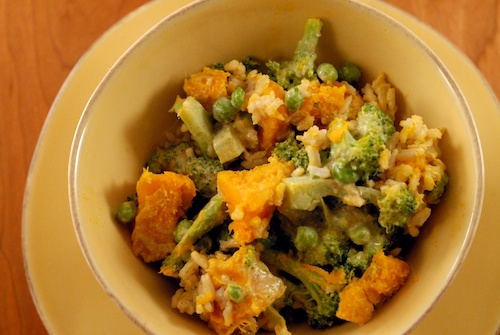 We used Lundberg Organic Sweet Brown Rice which is available through Amazon in organic or eco-farmed varieties. White sushi (Japonica) rice is more traditional for Asian recipes like sushi and onigiri. But I prefer a whole grain, so I use brown sweet (sticky) rice which sticks together better than other brown rice. Sticking together is essential for making rice balls! Cherry blossom viewing wouldn’t be complete without a little haiku, and my husband and son and I came up with a few. Traditional thoughts about the beauty of the cherry blossoms and their brevity, the rain of falling petals both beautiful and a harbinger of death. Hug your loved ones close, you never know how long you have together. Baked Brown Rice Pudding This economical brown rice pudding is an easy dessert or even a stand-by dinner. Vary the spicing: nutmeg and cinnamon, saffron and turmeric, or cardamon and allspice. 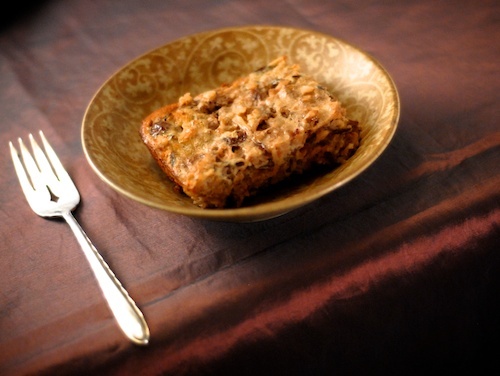 Add chopped fresh fruit like pear or apples, or dried fruit like raisins, dates, or cherries. 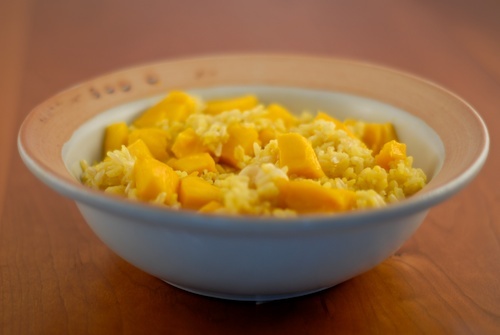 Saffron Rice with Mango and Macadamia Saffron flavors the rice and gives it a beautiful yellow color that goes nicely with the yellow-orange mangos, while the macadamia nuts add richness and a little texture. What a nice way to spend a day! I’ve never been to DC, but I would love to see the cherry blossoms. It was wonderful! I can see why you thought DC, but I live in the other Washington, the one on the West Coast, we have some nice cherry trees too! Washington has been great with it’s spurts of sun lately!! I loveee the cherry blossoms we have. What a fun day, and those rolls look awesome! I love them, too, we have a double blossom pink cherry tree in our yard that is just coming into bloom! And I hear we will be getting more sun this week, can’t wait. The cherry blossoms look beautiful. With those bright blue skies, the sunshine, it’s where we all should be. I have such a tough time rolling up sushi rolls. I think it’s because I always try to overstuff. Don’t worry, Joanne, these are much easier to make than sushi! Yup, it’s definitely easier to make than sushi! I can’t think of any better place right now than under a cherry tree with good eats in my hand! So pretty! I never had onigiri before! They sound and look delicious! Another one to put on my list of things to try. Ha, the list of things to try just keeps expanding, doesn’t it? Sounds like a good reason to me! 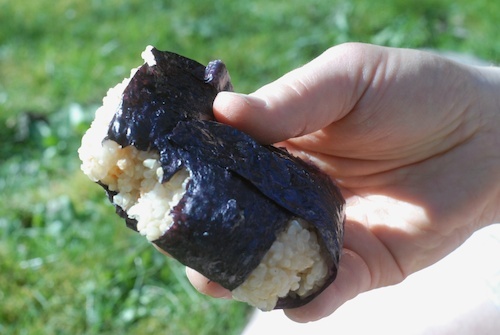 And onigiri will be a great way to start, it’s a lot easier than sushi! I’ve been looking for a sticky brown rice for some time now. What brand are you using and where did you buy it? I’d would have loved to see the cherry blossoms, but around here we’re see some beautiful desert wildflowers. 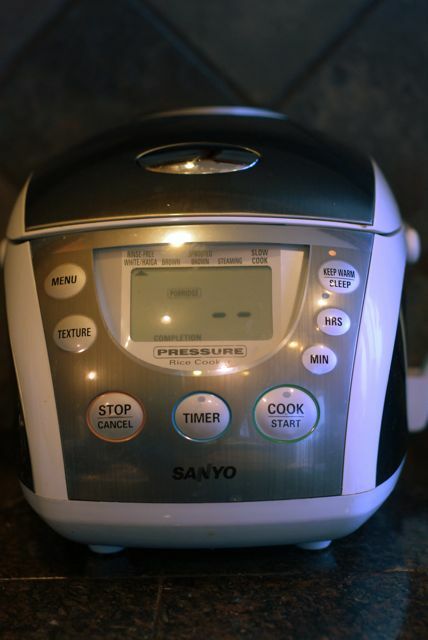 Mireya, I added a link to where you can get the rice on Amazon. I use Lundberg Organic Sweet Brown Rice. My local co-op, PCC in the Seattle area, has it in bulk, so I that is where I got mine. Such a great idea! I need to be making more of these. And I’m jealous of all of the gorgeous cherry blossoms. They are a handy, portable gluten-free snack with lots of carbs, I wonder if they could work on a run? The cherry blossoms are almost done, I have a double-blossoming pink cherry tree in my yard and I think that’s the last variety to bloom. A picnic under a cherry tree sounds awesome! You’re right about hugging your loved ones close, Mary. We all need to treasure the time that we have with our loved ones. Yes, spending time with family is something that you won’t regret in the long run. The picnic was really nice. If I lived where you did I imagine I’d be out looking at the bluebonnets. Is it still Texas wildflower season, or is that over?